Since Superstorm Sandy made landfall in late October 2012, many boaters have yet to see the full scope of destruction and disruption in the Northeast. A storm of this magnitude does much more damage than what is seen on your local news station, and Sandy’s effects are still an issue for boaters, because many of the lighthouses, buoys and other structures that were affected by Sandy have not been repaired or replaced. Even if your vessel made it through unscathed, she still may not be out of harm’s way if you are not diligent and vigilant. 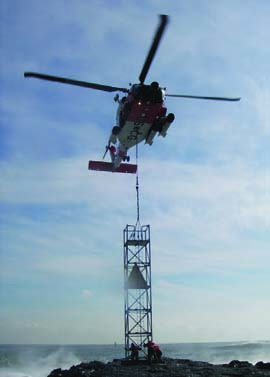 Many aids to navigation and other marine-related structures were battered, or even destroyed by Sandy. Furthermore, big storms often shift the contour and location of shoals at harbor entrances. Prior to venturing from the dock (for any reason, but most especially following a storm of this proportion), a prudent mariner will always check the U.S. Coast Guard’s Local Notice to Mariners (LNM) for potential problems, construction, maintenance and special events that may affect your plans…or your keel! The LNM is a weekly list of discrepancies in aids to navigation, as well as a list of special projects and events taking place that may inhibit normal passage of bodies of water. If a buoy is adrift, sunken, missing, damaged, inoperable, etc., the LNM keeps an ongoing watch and list of the observed buoys, breakwaters, shoals, lighthouses and projects (dredging, bridge repair, etc.). Now is a good time to check in with the LNM for your region. Here is a breakdown of what the LNM offers, and a sample of each section. At press time the number of discrepancies, corrections and proposed changes were too numerous to list. Go to windcheckmagazine.com/weatherandtides/localnoticetomariners for the complete and updated list. There is a key of abbreviated terms that you’ll be flipping back and forth to as you read through the LNM. Many people print this out and have it ready so that they can quickly peruse the LNM. Example: INOP – Not Operating, LBB – Lighted Bell Buoy, HAZ – Hazard to Navigation Section I – Special Notices This section contains general information of concern including range structures, endangered wildlife, federal regulations, etc. Section IV – Chart Corrections This section contains corrections to federally and privately maintained Aids to Navigation, as well as NOS corrections. This section contains corrective actions affecting charts. Corrections appear numerically by chart number and pertain to that chart only. It is up to the mariner to decide which chart(s) are to be corrected. Section V – Advance Notices This section contains advance notice of approved projects, changes to aids to navigations, or upcoming temporary changes such as dredging. Section VI – Proposed Changes Periodically, the Coast Guard evaluates its system of aids to navigation to determine whether the conditions for which the aids to navigation were established have changed. When changes occur, the feasibility of improving, relocating, replacing, or discontinuing aids are considered. This section contains notice(s) of nonapproved, proposed projects open for comment. Section VII – General This section contains information of general concern to the Mariners. Mariners are advised to use caution while transiting these areas. Example: MA – East Falmouth, The Coast Guard has received a report of shoaling in the Eel River at (PA) 41-33.30N 070-32.88 W. The depth is 2.5 ft at low water. The shoal is marked with a temporary hazard buoy. Mariners are requested to proceed with caution while transiting the area. Section VIII – Light List Corrections This section contains corrections to federal and private aids including position, light duration and color. This section contains a list of bridge deviations and regulation changes. This section includes bridge height changes, construction, replacement, closure and repair. This section contains the name, date, time and location of special events taking place in navigable waters such as regattas and fundraising events. This section shows survey operations taking place, the type of surveying, vessels involved and area shown on chart as well as contact information for questions or concerns. Clearly, the best way to avoid hitting anything is to be vigilant and prudent while boating. Likely the biggest threat out there is going to be fellow boaters, but when weather comes up fast, we tend to head for harbor. Knowing ahead of time that you cannot cut a corner, that a light is extinguished, or that a dredging barge may be blocking your way, is much better than finding out during a squall. Make it a habit to check your LNM regularly. The Coast Guard even has a one-way email that they will send with updates to the LNM. To sign up, go to windcheckmagazine.com/weatherandtides/localnoticetomariners.